This 10 x 16 garage benefits from a tall, weather-resistant apex roof. Underneath the plastic exterior is a fully-fledged galvanised steel metal frame. Not only does this provide the garage with exceptional stability, but it also provides excellent additional protection against rust. With an integrated skylight and ventilation, pad-lockable doors and Shiplap style cladding, this truly is a remarkable building. 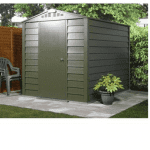 This is a fantastic quality, spacious metal garage made from exceptional materials. Not only is it highly durable, but it also benefits from a very attractive design. An apex roof is added to the building to give it fantastic rainwater protection, as well as plenty of interior head room. In fact, its height is one of the garage’s main benefits, with its roof measuring 2.17m high and the eaves reaching up to 1.86m high. The depth of the building is also really generous at 4.80m and the 3.21m width also ensures you have plenty of storage space and room to move around. The double doors measure 2.23m wide and 1.81m high so again you have a lot of room available to transport items in and out of the building. One of the things we like about this garage is its Shiplap style cladding. This is something that is very common on wooden sheds, though it usually requires annual maintenance. The Shiplap design is known for both its visual benefits and its strengthening benefits. 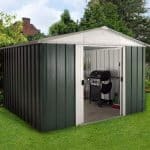 However, what you will find with metal buildings like this one, is the PVC Shiplap cladding is mainly used for aesthetic purposes, though it does still provide great protection against the elements. The garage also benefits from an incredible hot dipped, galvanised steel frame. 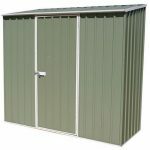 It provides a solid, stable and durable structure, helping to support the building all year round. It is rust resistant and isn’t easy to damage. So you have great peace of mind that the building will last for many years to come. There is a floor included with this garage, so it is something you need to be aware of. On the one hand it gives you flexibility on where you can build it. The floor is built with integral vinyl cladding so it does provide plenty of strength. However, you may need to wary if storing vehicles in the garage. 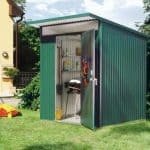 One of the great things about metal sheds is they require very little maintenance. This model is fantastic for those who don’t want to have to worry about annual treatments. It requires absolutely no maintenance at all. Once you’ve built it, you are free to just enjoy the benefits of the building without worrying about the additional cost and hassle of regular treatments. The galvanised steel has been hot dipped to protect the frame against rust, while the PVC cladding helps to give the garage an extra level of rust and rain water protection. Waltons also provide you with a 10 year anti-rust warranty. So you really do gain ultimate peace of mind when you invest in this model. This isn’t just your standard metal garage. It not only comes with large, wide double doors, but it also features a single side door for added convenience. All of the doors are pad-lockable, ensuring your storage is completely safe. Another thing that makes this range stand out is the fact that the buildings do come with a window. It is a small window but it still provides a little extra lighting during daylight hours. Due to its small size it also doesn’t compromise too much privacy. However, we do recommend covering any valuable items just in case potential thieves do peer in. Another feature worth mentioning is the integrated skylight. This helps to provide a lot of additional light into the building, without compromising security. Thanks to the incredibly tough exterior, this garage is one of the most secure on the market. It is extremely difficult to break into and it also benefits from pad-lockable doors. So you can rest easy knowing whatever you do decide to store in the building, it will be totally protected. Privacy wise the small window does give potential thieves the chance to see what’s inside. However, it is a small window and due to the level of security on the garage, it shouldn’t pose too much of a problem. According to Waltons, there are a lot of different customisation options and extras available for this garage. However, these aren’t shown on the actual product page. The manufacturer usually makes it pretty clear what extras you can add to your purchase. So if you are wondering what options you have, you will need to manually search the site. Whilst it isn’t a major issue, it does mean you could miss out on valuable extras that could really help to improve the building’s overall efficiency. It doesn’t appear to come with any freebies either which is also a disappointment considering the cost. However, the overall design of the garage and its exceptional durability does make up for the lack of customisation options. You really don’t need to worry about the quality of this garage. Every part of its construction has been designed with the highest quality materials. You can tell by the 20 year guarantee that the materials on this garage have been designed to really stand the test of time. The high tensile steel construction is built to be rodent resistant, weather resistant and fire resistant. 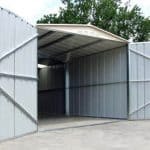 This is a large building that will allow you to store practically anything you need to. From BBQs to machinery and small vehicles, it provides plenty of space and great easy access into the garage. There are a number of things to take into account with the installation of this building. Firstly it’s important to say that Waltons have provided fantastically detailed instructions to make assembly as easy as possible. The components are pre-cut, drilled and numbered for your convenience. However, while it is simple to follow the instructions and the panels do fit well together, it will take a long time to build. Due to the steel construction, the panels are also pretty heavy. So these things do need to be taken into account. Initially this seems like a very expensive garage. It does come at a pretty high initial cost. However, in terms of value for money it’s actually pretty good. Firstly you don’t have maintenance to worry about. So you’re saving money on annual treatments. Then there’s the fact that the building is fire, rodent and water resistant. So there is very little chance of having to pay for repairs due to damage. You are also given an excellent amount of space and it’s extremely secure and private, lowering the risk of burglary. Overall we feel it has fantastic value for money if you can afford the initial purchase cost. Final Thoughts: This garage is one of the best buildings we have reviewed. It provides exceptional all-round performance, offering everything you need from a garage. 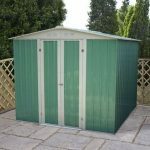 The impressive features help to ensure you have a fantastically durable and secure storage facility and the ventilated gables are a great addition to protect against condensation. 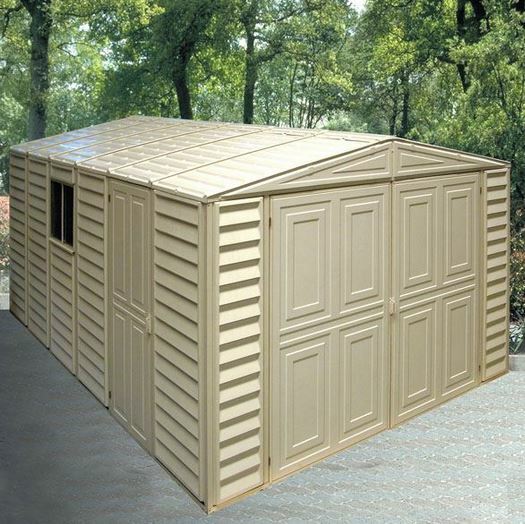 Providing you have a large, flat, solid surface to build the garage on, we highly recommend this model.